Are you looking for a flooring material that is versatile as well as beautiful? Choose tile flooring in Yorkton, SK, to upgrade the look and appeal of any room in your home. When it comes to tile, our showroom has a full selection of porcelain, slate, and ceramic tile to choose from. With such a wide range of choices, you’re sure to find the perfect flooring option to suit your needs as well as your budget. Allow our friendly and knowledgeable staff to make shopping for remodeling materials pain-free. We’re always ready to discuss your project with you and help you choose the best flooring to complement your style and fit within your budget. Tile continues to be extremely popular for its beauty, ease of maintenance, and the value it adds to any kind of property. Tile is such a versatile and varied material that you can use it in every room of your home from the bathrooms and kitchen to the living room and bedrooms. Our collections of tile flooring are available in many styles and colors that include ceramic, porcelain, slate, hardwood appearance, and solid colors. Whether you’re using the same size and style of tile for the entire room or you want to create a unique mosaic pattern, we have what you need to create a stunning effect. In addition to its classic style and range of appearances, tile floors have many other benefits. Its maintenance needs are simple and easy. Periodic sweeping and mopping with a mild cleaning solution is all that is needed to keep tile looking great. Tile is water, stain, and scratch resistant, making it ideal to use in busy areas like the kitchen, bathrooms, or hallways. Adding ceramic, porcelain, or slate tile to your home is also a great way to improve its value. 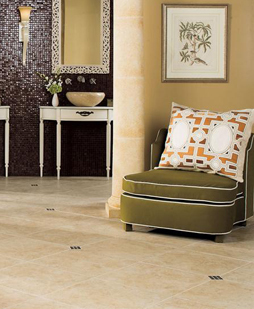 Whether you’re selling now or in ten years, tile floors add significant value to any property. Their durability and longevity means your home’s floors are sure to look and function great for many long years. Protect your new investment by scheduling tile flooring installation with us. A team of professionals is able to fully remove your old flooring, prepare the subfloor, and install your brand-new flooring properly. With professional installation by skilled contractors, you know your floors are sure to look and function well for many years. Contact us to choose from a full selection of tile flooring options. We’re proud to serve clients in Yorkton, Wroxton, Willowbrook, Kelliher, and Ituna, Saskatchewan, as well as the surrounding areas.